Symbol for aspartic acid or its radical forms. Any of several venomous snakes, especially the viper Vipera aspis of southern Europe, the cobra Naja haje of Africa and the Middle East, or the horned viper. a nonessential amino acid present in sugar cane, beet molasses, and breakdown products of many proteins. Pure aspartic acid is a water-soluble, colorless crystalline substance. Aspartic acid is interconvertible with oxaloacetic acid from the citric acid cycle. Aspartic acid is used in culture media, dietary supplements, detergents, fungicides, and germicides. 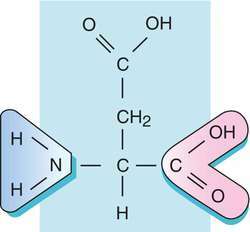 Also called aminosuccinic acid. See also amino acid, protein. A gene on chromosome 17p13.3 that encodes aspartoacylase, which catalyses the conversion of N-acetyl_L-aspartic acid–NAA to aspartate and acetate. NAA hydrolysis by aspartoacylase may help maintain white matter. 1. Alternative site provider, see there. 2. Application service provider, see there. Abbreviation for aspartic acid or its radical forms. Abbreviation for application service provider. And, unlike a traditional ASP, the service bureau is a "multiclient shared service," with the members participating in its governance. With the extensive training resources of the ASP, customers are able to more easily adapt to changes in applications or the introduction of new applications. As the ASP marketplace continues to consolidate -- through mergers, acquisitions and shutdowns -- finding an ASP with longevity is more and more critical. When asked why the ASP model was not achieving faster adoption, customers pointed to internal tactical hurdles such as loss of control and reassigning, retraining or releasing workers, and sunk costs already invested in running software in-house. The ASP community has grown to include nearly a million Web developers," said John Shell, senior product manager at Sun. For more information on attending or sponsoring the ASPIC Global Meeting, visit the ASP Industry Consortium Web site at www. In addition to offering discounted liability insurance to members, the ASP Industry Consortium plans additional insurance-related initiatives. Given the tremendous attention that last years ASPire Awards program received the ASP Industry Consortium is looking forward to providing our members with another opportunity to demonstrate the hard work and high levels of performance that are helping to define the ASP delivery model," explained Hunter. I am honored to be elected to serve on the board of the ASP Industry Consortium," said George Caravias. TeleComputing ASA, (Oslo Stock Exchange:TCO), a leading worldwide ASP and ASP-enabler, today announced that its Chief Technology Officer, Jeff Hagins, has been elected to the Board of Directors of the Application Service Provider (ASP) Industry Consortium for 2001. The first effort undertaken by the ASP Industry Consortium and the Information Technology Association of America (ITAA) is to jointly define the term "application service provider.